DGT 2010, the official chess clock of the world chess federation FIDE. The DGT 2010 was introduced in 2007 and received the status of "Official FIDE chess clock" in June 2008 after tests by four top-level arbiters concluded that the clock is in full accordance with all FIDE rules and regulations. 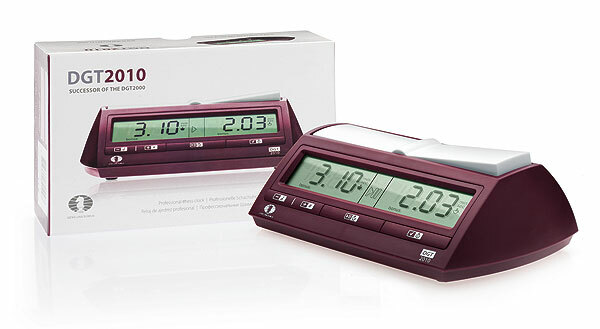 The DGT 2010 is the successor of the DGT 2000, which was the best selling digital chess clock ever with over 250.000 clocks sold world wide. The new model 2010 is improved on many points. Larger display, with more information for player and arbiter e.g. visible timing system, black-white indicator and a big "flag". New and improved lever system. More timing options, including the latest timing systems used in top level tournaments. Easier to program in manual set with the new "-1" one-step-back button. See our video instruction. High energy efficiency. Runs more than five years on 2 AA alkaline batteries. Batteries included. The DGT 2010 is suitable for use with many games e.g. it has Japanese and Canadian Byo-yomi settings for Go. For more information, take a look at the DGT 2010 manual. 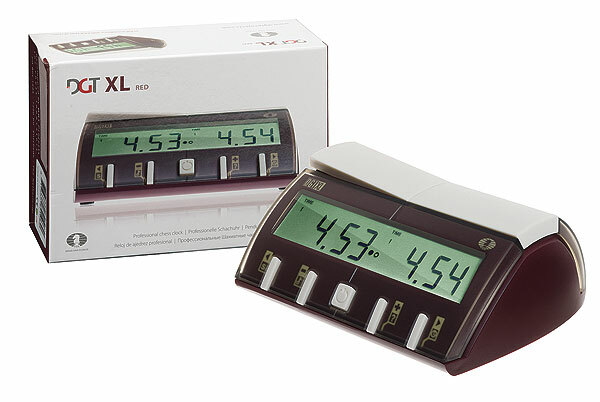 The DGT XL, introduced in 2003, is in full accordance with FIDE rules and regulations. It is the clock you will see most frequently in photo reports of top level tournaments, as it is the only clock that connects to the DGT electronic chess board, used for “live” internet broadcasting of chess games. It has all the advantages of the DGT 2010, the other DGT clock approved by the world chess federation and several extra options and features, which make the DGT XL the ultimate in chess clock technology. Clock's display shows move if the DGT e-board is used for online or PC play. For detailed information, look at the DGT XL user manual.